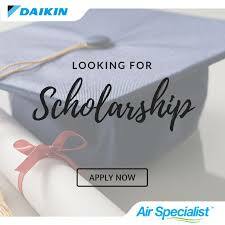 Daikin, the world's no.1 air conditioning company, is offering a scholarship to eligible students who have already gained acceptance into Malaysian Public or Private Universities pursuing their 1st year degree programme. d. Already gained acceptance into Malaysian Universities (IPTA/ IPTS). Preference will be given to students from IPTA. SPM or equivalent – min 6As + pass all subjects. Good results in Mathematics, English, and Bahasa Malaysia. STPM/ Pre-University/ Local Matriculation/ Diploma/ Foundation – min CGPA 3.00 & above. l. Students who meet the above criteria (a to k) are welcome to apply. However, preference will be given to students from families with household income of RM5,000 per month or below. b. Applicants must submit their application to daikin.scholarship@daikin.com.my with all documents attached in PDF format. c. Applications are open for submission now and close on 31st August 2018.
d. For any further enquiries, please contact Ms. Kay Lee Yen Hui (603-6145 8632) or Mr.
47000 Sungai Buloh, Selangor D.E. Malaysia. be notified 2 week after application deadline. b. The final selection will be based on interview results. i. Incomplete submission of documents. ii. Scholars (students) who do not meet the criteria in para (1). iii. Application received after the deadline.